The latest news from Wes Sanford at Northrop and Johnson is that he's sold Monte Fino's 25m cockpit motor yacht Prime Time, with Bob Cury of RJC Yachts acting for the seller. Delivered in 2001, Prime Time has a high gloss cherry interior and sleeps up to seven guests in a master, VIP and twin along with a Pullman berth and all the ensuite bathrooms have marble and granite worktops. 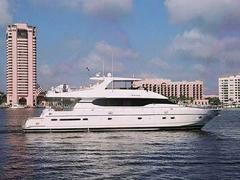 With a cruising speed of 20 knots, this superyacht was asking $1.995 million.